Gertrude Stein wrote this witty play on the psychological phenomena of assumed personality and glorified self image after having attended a celebrity party in her honor in Beverly Hills in 1936. 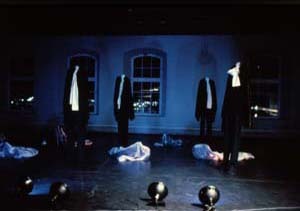 In this production of the play her text is interpreted through the choreographed movement of evening dresses and dinner suits. The graceful shapes and movements of their empty sameness underline Gertrude Stein’s picture of the sophisticated party: the elegant superficiality and purposeless movement that inspired Stein’s play.